I often write short text documents on my iPhone, and want to insert a date stamp in the format YYYY-MM-DD. Is there a utility or other means by which I can quickly insert a date stamp instead of typing it manually each time? Sadly, the Shortcuts app is one item short of doing this pretty much natively. 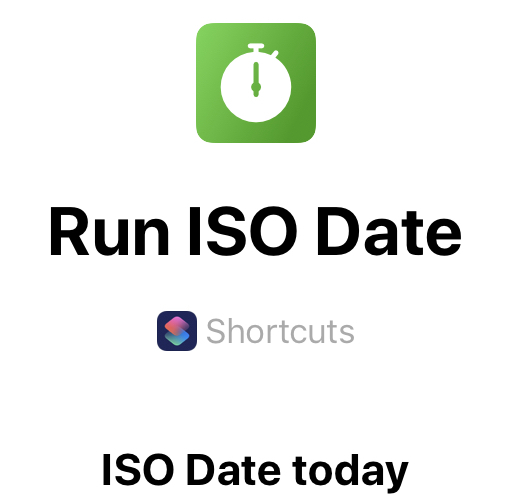 It has a text function that pastes in the value of the current date, but there isn’t ISO formatting option. I tried a Pythonista script that works very well to get the values you need, just am missing some glue to turn it into a shortcut. Siri can even trigger this shortcut (or share sheet) for you, once I figure out how to get the two connected. Not the answer you're looking for? Browse other questions tagged ios text-input . iOS: how can I disable calendar alerts? How can I view the time of a text message in iOS 7? Is there a way to display the date of the scheduled event on the calendar immediately following adding a date to the calendar?